This is a great price on one of the best kid-centric activity trackers on the market. Need a last minute Valentines day gift for the techaholic or fitness buff? This is it. 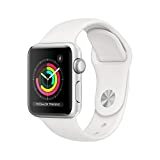 Great price on a current generation Apple watch, in case you need to buy yourself a little something after shopping so hard these past weeks! Impressive and functional watches from Citizen are deeply discounted today. One of the best smartwatches on teh market is down to its Black Friday price already. Select Fitbits are up to $50 off today. One of the most durable watch bands you will find. One of the best rated Smart Watches available at a price lower than ever. Classic and proven year after year, this is the digital watch for people who do proper work. Good add on for anyone getting a Fitbit this Christmas. I use an love my Android Wear watch every day. At this price, I’m considering an upgrade! Nice selection coupled with the lowest prices we’ve seen recently. One of the best smartwatches available is deeply discounted today. This watch pretty much does it all. This watch has it all! One of the best Android Wear watches available is down to just $164.88 right now. Definitely worth buying if you’re considering a SmartWatch. If you’ve been holding out on an Apple Watch deal, your day has come. One of the most classic and elegant men’s watches in Seiko’s lineup at the lowest price we’ve seen. Incredible price on a full-featured Android Wear watch. I own a similar model and couldn’t be happier with its usefulness. Didn’t get that watch you really wanted for Christmas? Now is your chance, and at lowest price too! Amazon’s offering an incredible price on the Gen 2 Apple Watch. If you’ve been considering putting one on your wrist, today is the day to lock in a purchase. This is hands-down the best price we’ve seen on the best smartwatch available. Elegant, powerful and functional – it’s better than the LG I wear on my wrist and I didn’t think that was possible.